Excellent gift for golfers young and old! Spring Clearance! The Bushnell 5x20 Golf Scope Monocular is a compact 5x monocular with an internal reticle that makes estimating the range to the pin quick and easy within a range of 50 to 200 yards. 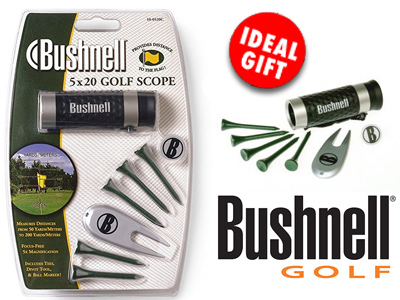 The Bushnell 5x20 Golf Scope Monocular comes with 5 tees, a ball marker and a divot tool. It will make club choice a snap, eliminate overshots, and produce a better-looking score card. No golfer should tee off without it! Don't just guess distance to the flag. KNOW it with the Bushnell 5x20 Golf Scope! To use the 5X20 Golf Scope, line the base of the flag up with the bottom line of the reticle; then determine distance to the flag by reading the numbers on the reticle that align with the top of the flagstick. Note: For lens-cleanliness with convenience, rely on pre-moistened lens towelettes.